EAST HARTFORD, Conn., Feb. 18, 2019 /PRNewswire/ -- Pratt & Whitney, a division of United Technologies Corp. (NYSE: UTX), and Embraer celebrated delivery of the GTF™ PW1900G production engines for the E195-E2 aircraft at Embraer's E2 final assembly line in São José dos Campos, São Paulo, Brazil. The E195-E2 is expected to enter into service in the second half of 2019 with Azul Brazilian Airlines. "We are excited to receive the GTF production engines for the initial serial production of the E195-E2, as we know firsthand the advantages that these engines provide to our customers and the environment," said Fernando Antonio Oliveira, Embraer's E2 Program Director. Embraer's E190-E2 aircraft, which is also powered by the Pratt & Whitney PW1900G engine, entered service in April 2018 with Widerøe, followed by Air Astana in December 2018. "Delivering the first production engines for the E195-E2 is an important milestone for the program," said Graham Webb, vice president of Commercial Engine Programs at Pratt & Whitney. 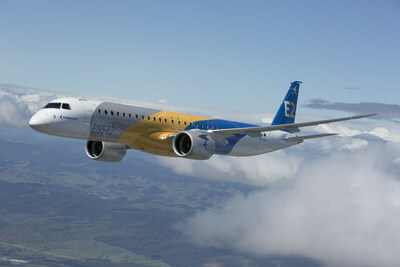 "We look forward to continuing to work together to support Embraer's second GTF-powered E2 aircraft model." In addition to being selected as the exclusive propulsion system for the E2 commercial aircraft, Pratt & Whitney's APS2600E auxiliary power unit (APU) is the sole-sourced APU for the E2 family. The APS2600E APU gives airlines greater flexibility, by increasing the altitude ceiling for ETOPS and other operations, and providing a significant increase in electrical power delivery to meet the needs of today's airlines. The E195-E2 aircraft has more than 24% reduction in fuel burn per seat than the previous-generation E195, with NOx emissions 50% below the ICAO CAEP/6 regulation and 19dB to 20dB of ICAO Chapter 4 cumulative noise margin. This press release contains forward-looking statements concerning future business opportunities. Actual results may differ materially from those projected as a result of certain risks and uncertainties, including but not limited to changes in levels of demand in the aerospace industry, in levels of air travel, and in the number of aircraft to be built; challenges in the design, development, production support, performance and realization of the anticipated benefits of advanced technologies (including our expected returns under customer contracts); as well as other risks and uncertainties, including but not limited to those detailed from time to time in United Technologies Corp.'s Securities and Exchange Commission filings.